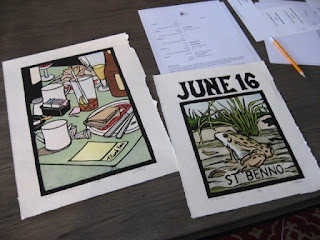 When we were starting to install the print show in Ocean Grove, a few things came up. When Mary had previously mentioned that she feared there would not be enough east coast printmakers (the advance list of west coast printers was quite long) I had offered to loan her a few more if she needed to fill wall space. On Tuesday she decided that she could use two more, so I made plans to dig some up. That same day, I also inquired about postcards. I couldn't remember if it was decided to have any or not. She thought there may be some, just hadn't been done yet with other priorities handled first. Yesterday I sent her an e-mail with information about postcards and their history. Their place in the art world has changed radically, which I think is a generational thing. Back in my school days, postcards were a necessity, the idea of doing a show without them was almost unheard of. Not nearly so common these days, a few decades later. What happened? My guess is the world changed. That never stops. I remember once in the late 1980's, my college friend Dave and a high school buddy of his took a trip north and my father gave us a lift into SoHo, where our painting professor was doing desk duty at a co-op gallery he was a part of. The SoHo neighborhood had once been home to a lot of manufacturing businesses, and the buildings had large loft spaces. But those businesses moved out and the empty abandoned buildings were gradually taken over by artists, who needed cheap spaces and were not concerned about the lack of active commercial businesses in the neighborhood. (on that first trip, it took a long time to find a place that served food for lunch) In the early days, it was just block after block of galleries and studios, and we spent the day walking in and out of spaces, looking at art not found in art history textbooks, and collecting postcards. A very fun day for us art types. One thing that doesn't change in the world is that when artists reclaim a neighborhood, an audience comes, and businesses move in to cater to that audience, creating a demand for spaces and raising prices, driving out the artists. About 15 years later I had occasion to show art in SoHo, as part of a curated group show in a 7th floor walk-up. The ground floor spaces were occupied with competing branches of Starbucks. (no more street level galleries) The arts neighborhoods of SoHo and the Village gave way to Chelsea, then Brooklyn and whatever comes next. Years ago I was part of a group show in a reclaimed building in Union City, and a few days ago I told the story of how our space in Ocean Grove came into existence. Postcards were a part of many other shows I was a part of, both solo and group, easily into the 21st century. But now they are much rarer. Part of that may be to save money, even as the cost of producing them has been brought way down by technology. I think most of it is that younger people have no interest in anything printed on paper. They don't write or mail letters, don't read books, and probably don't collect postcards. They prefer all information to come in electronic form- websites, e-mails, texting, etc. If they can't download it to their smart phone, they don't want to see it. So I wrote to Mary (and her daughter Katie) yesterday, since they had asked what kind of information would go onto a postcard. I shared some of the above information and some of my experience of the past 30 years. I also advised seeking information from the Portland contingent, since they make up more than half the artists. In the end, it's up to the organizers and the host I figure. Winter weather roared through yesterday, but was melted away overnight, so it was possible to venture out today. I have a considerable number of completed unframed prints stored in my apartment, so I selected an assortment of Everyman (saints) and Ecclesiastes prints, which are about the right size for the plastic sleeve hanging system, grabbed several postcards, and drove up to Mary's house in the afternoon. From the prints I had brought, she selected two prints for the show. On the left is an Ecclesiastes print, "Money answers for everything" which comes from a passage that reminds us that food and drink are quite enjoyable, but eventually there is a price for everything. My visualization was based on a typical restaurant table at the end of a meal, covered with empty dishes and glasses, used utensils, spilled food, trash, and of course the bill. On the right is ST BENNO, from the saint series, which borrowed heavily from an earlier black and white piece I had done involving a toad, dead grass, and a quote from Christopher Smart relating to toads. Now redone in color, with the story of St Benno, a bishop who loved fine music and was annoyed by the loud croaking of frogs around him and commanded them to be silent. He quickly regretted this, as he realized that frog noises might just be the way they choose to praise God, took back his command, and the frog noises continued. The toad quote came from Smart's long form poem Jubilate Agno, which includes a section about his cat Geoffrey, who he believes praises God in being as cat like as he can is all his cat activities. That pure animal behavior worked into both pieces and was respected by both Benno and Smart is just a coincidence.